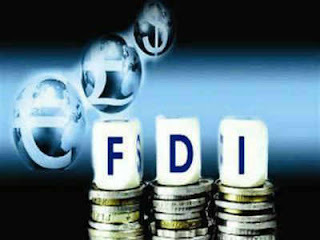 Commerce Minister Suresh Prabhu said that FDI inflows into India rose to around 3% to US $ 61.96 billion in 2017-18 compared to US $60.08 billion in 2016-17 . The Minister also said that during the four years of the Modi government, foreign inflows jumped to US$ 222.75 billion from US $ 152 billion in the previous four-year period. However, this statement from the Minister comes in response to another news that is contradictory to this news. According to an UNCTAD (United Nations Conference on Trade and Development) report, "foreign direct investment (FDI) to India decreased to $40 billion in 2017 from $44 billion in 2016, while outflows from India, the main source of investment in South Asia, more than doubled." It must also be noted that the government has not arrived at a deal with the iPhone & iPad manufacturer Apple while Apple has asked for certain concessions for setting up manufacturing unit in the country. Another major US company in the electric vehicle sector: Tesla is not clear in whether to make an investment in India or not. The US-based electric vehicle maker recently cited a challenging environment for not making it to the Indian market. Foreign inflows play a significant role in India's growth as India needs large scale investments to make progress in developing its infrastructure such as ports, airports, highways etc.